Lipoedema – a disorder of fatty tissue distribution over the thighs, lower legs and hips. In lipoedema, a fold of skin can pulled up over the second and third toes or a finger (Stemmer's sign is negative). In lymphoedema, this is not possible (Stemmer's sign is positive). 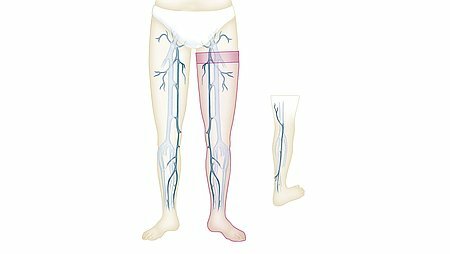 Other signs of lipoedema are a tendency to develop spider veins, bruises or increased swelling of the calf in the second half of the day. In contrast to lymphoedema, lipoedema is always symmetrical. It presents as “pillar-like” changes and deformation of the legs. The “saddlebags” around the hips and bottom are typical. If the disorder spreads further down the legs, we talk of the “drawstring trouser phenomenon” because the deformities always end at the ankles, which are, however, overlapped by the fatty tissue. Lipoedema is painful to pressure and touch. In the advanced stages, even wearing tight clothing is painful. In contrast to lymphoedema, “Stemmer's sign” is always negative in lipoedema. Jodhpurs are fatty pads over the bottom, hips and the insides of the knees that occur almost exclusively in women. Particularly women with a slender torso are often affected. If the fatty pads are immune to every diet and sporting activity, jodhpurs can be a sign of lipoedema, a congenital disorder of fatty tissue distribution. Another sign of lipoedema is susceptibility to spider veins and bruising and pain on touch and pressure. In contrast to lymphoedema, both legs – and sometimes the arms as well – are affected. The fat pads seen in lipoedema are not caused by overweight. This is why they cannot be counteracted by dieting. Nevertheless, losing weight and taking part in sporting activities (with compression) has positive effects. You should avoid putting on weight at all costs. If you are overweight, you should definitely try to reduce your body weight to a Body Mass Index (BMI) of between 19 and 25 and to maintain it. Compression garments reduce lipoedema or at least keep it constant. In stage 1, seamless, round knit compression stockings in CCL 2 or CCL 3 can often be used. But experts recommend flat knit compression care in most cases. The stockings should preferably be worn every day, but at least three days a week (during sporting activities as well). Your doctor or specialist staff at your surgical appliance retailer will be pleased to advise you. Patients in stage 2 use flat knit compression garments (seamed). In stage 3, complex physical decongestion therapy is applied similarly to lymphoedema. This starts in phase 1 with manual lymphatic drainage followed by application of a compression dressing. This is, in turn, followed by the maintenance phase and thus by the wearing of compression garments. Here again flat knit models are used. They offer optimum pressure stability because the material is less elastic. Why am I so fat – and why don't diet and exercise help? This was the question Susanne Vogt asked herself – until she was diagnosed with lipoedema, or abnormal accumulations of fat on the hips, bottom and legs.